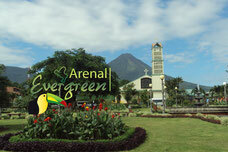 Excursion to La Fortuna and Arenal Volcano leaving from your hotel in San José. One day Tour. If your vacation plans don’t allow you to visit La Fortuna and Arenal Volcano for an extended time, we offer this one day tour plan so you don’t miss out on experiencing one of the most beautiful parts of the country. This excursion to Arenal from San José allows you to get out of the city and enjoy the tranquility of the dense forests, impressive views of Lake Arenal and Arenal Volcano, as well as to get in some adventure followed by relaxation at the Baldí, Tabacón, or Ecotermales hot springs. of your choice + Dinner + All Transportation. This excursion lets you enjoy the impressive beauty of Arenal Volcano as well as La Fortuna and its hot springs, one of the most popular tourist destinations in Costa Rica. After picking you up from your hotel in San José we will head towards Arenal Volcano, with a stop in route at the famous town of Sarchí; known as the cradle of the craftsmen of Costa Rica, this is the best spot to pick up a souvenir like wood products, clothes, or other trinkets. You can take photos with the world’s largest ox cart, made of cedar wood and decorated with a surprising variety of colors including a brilliant orange. 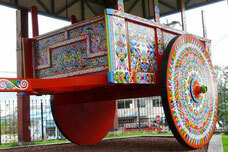 The design of the cart is typical of what is used in Costa Rica and took 70 days to construct; it is mentioned in the Guinness Book of World Records. The journey continues from there through forests as well as plantations of diverse agricultural products like coffee, pineapple, ornamental plants, as well as cattle ranches. As you progress you can observe the variety of micro-climates present in the country until you arrive to the beautiful town of La Fortuna. There you will stop for a delicious lunch with spectacular views of Arenal Volcano. After lunch we will visit a lookout point close to the volcano to appreciate up close the volcano and also get some views of Lake Arenal. Later on you can enjoy and relax in some of the best hot springs in the country. This excursion allows you to enjoy the beautiful and imposing Arenal Volcano by hiking easy access trails inside Arenal Volcano National Park, see magnificent panoramic views of Lake Arenal, and visit the town of La Fortuna with its relaxing hot springs. After we pick you up from your hotel in San José we will take you on towards Arenal Volcano; en route we will stop for a delicious Costa Rican breakfast. The journey continues from there through forests as well as plantations of diverse agricultural products like coffee, pineapple, ornamental plants, as well as cattle ranches. As you progress you can observe the variety of micro-climates present in the country until you arrive to the beautiful town of La Fortuna. After a brief stop we will continues on to the National Park for a hike that will allow you to get as close as safely possible to the volcano. 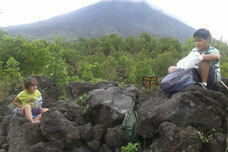 We will also visit a lookout point with spectacular views of Lake Arenal. At the end of the hike you’ll enjoy a delicious lunch in a home-style restaurant with spectacular views of Arenal Volcano. 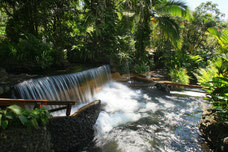 After lunch we will take you to the delightful Hot Springs of your choice to relax and enjoy a dinner buffet. Around 6:00 pm we will start the return journey to your hotel in San José. With this option we offer you a complete excursion to enjoy not only the beauty of the imposing Arenal Volcano plus La Fortuna and its hot springs and combine that with the adventure of either soaring through the treetops on a zip line or hiking surrounded by nature across hanging bridges. After we pick you up from your hotel in San José we will head towards La Fortuna, with a stop on the way for breakfast. 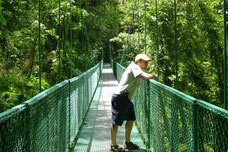 After this part of your tour we will take you to a spot with spectacular views of Lake Arenal. After this experience we will take you to enjoy a delicious home-style lunch in a restaurant with great views of Arenal Volcano. 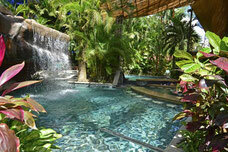 After lunch we will take you to the hot springs of your choice. After a delicious dinner buffet at the hot springs, we will take you back to San José. With this option we offer a complete, special excursion for the most adventurous visitors. You’ll not only enjoy the beauty of the imposing Arenal Volcano and La Fortuna and its hot springs, but also combine it with adventure. We start off with a White Water Rafting trip down the Rio Balsa; you can choose between Class II & III or III & IV rapids. 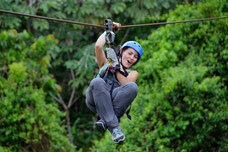 We will also live out the excitement of traveling by cables through the tree tops with a zipline or Canopy Tour. 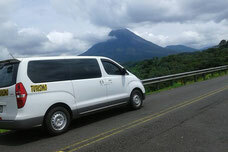 After we pick you up at your hotel in San José we will head to the Arenal Volcano area, stopping for breakfast en route. The journey continues when the professional, experienced rafting guides join us for an adrenaline packed, exciting, and fun two hour excursion on the Balsa River. After we get off the river we’ll board the shuttle van again to continue on to the beautiful town of La Fortuna and enjoy our lunch. The next activity is a Canopy Tour or Ziplining where you’ll enjoy spectacular views of the forest from another perspective and live out the excitement of flying from one platform to the other. At the end of the tour we’ll visit a lookout with spectacular views of Arenal Volcano and take you to enjoy the delightful hot springs that you choose when you reserve the tour. Finally enjoy a delicious buffet dinner before we return to San Jose.